Apleurotropis strix Hansson, head frontal female. Apleurotropis strix Hansson, thoracic dorsum female. 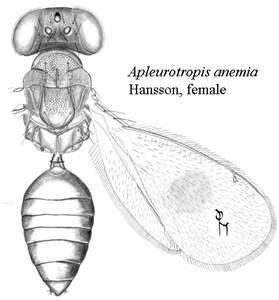 Apleurotropis anemia Hansson, lateral pronotum with longitudinal carina. 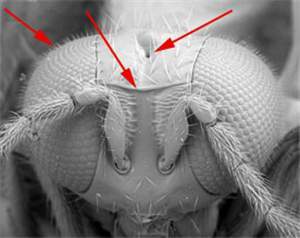 Apleurotropis anemia Hansson, part of forewing with stigmal and postmarginal veins. Girault. A.A. (1913). Memoirs of the <?xml:namespace prefix = st1 ns = "urn:schemas-microsoft-com:office:smarttags" />Queensland Museum, 2:77-78. Apleurotropis viridis Girault, by original designation. Epentedon Girault, 1915: 186. Type species: Epentedon unnotipennis Girault, by original designation. Synonymized by Boucek, 1988: 711. Horismenella Girault, 1915:189. Type species: Horismenella clariviridis Girault, by original designation. Synonymized by Boucek, 1988: 711. Pleurotropomyia Girault, 1913: 145. Type species: Pleurotropomyia grotiusi Girault, by original designation. Synonymized by Boucek, 1988: 711. Propleurotropis Girault, 1937:1�2. Type species: Propleurotropis minii Girault, by original designation. Synonymized by Boucek, 1988: 711. 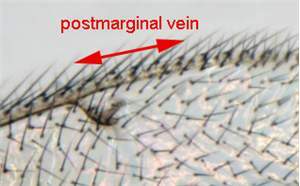 Eyes with dense long hairs; vertex with a pit or a short groove in front of anterior ocellus; frons just above frontal suture raised to form a carina, V-shaped, straight or slightly down-curved laterally; pronotum with a transverse carina close to posterior margin, laterally also with a complete longitudinal carina; mesoscutum usually with a median groove in posterior 1/3�1/2; mesoscutum and scutellum with engraved and strong reticulation; postmarginal vein long, 2.4�3.7X as long as stigmal vein; propodeum with complete and more or less parallel plicae and with a complete median carina. Primary parasitoids on leaf-mining larvae of sawflies (Hymenoptera), Agromyzidae (Diptera), Hispinae (Coleoptera, Chrysomelidae), and various Lepidoptera groups (Boucek 1988). Hosts for the species described here are mainly from leaf-mining Lepidoptera, with one record from a leaf-mining Diptera and one from an unidentified gall: Bucculatrix sp. (Lepidoptera: Bucculatricidae) on Forsteronia spicata (Apocyanaceae); Elachista sp. (Lepidoptera: Elachistidae) on Olyra latifolia (Poaceae); Marmara sp. (Lepidoptera: Gracillariidae) on Heliconia sp. (Heliconiaceae); Phyllocnistis sp. (Lepidoptera: Gracillariidae) on Trichilia havanensis (Meliaceae); Tischeria spp. (Lepidoptera: Tischeriidae) on Coussapoa villosa (Moraceae) and Gouania polygama (Rhamnaceae); unidentified Elachistidae (Lepidoptera) mining leaves of Bambusa (=Guadua) angustifolia (Poaceae); unidentified lepidopteran leafminers on Saurauia sp. (Actinidiaceae), Trichilia havanensis, Peperomia peltata (Piperaceae), unidentified Asteraceae, Heliconiaceae and Melastomataceae; Agromyzidae indet. (Diptera) on Tradescantia sp. (Commelinaceae); from a leaf pustule gall on Ficus hartwegii (Moraceae). 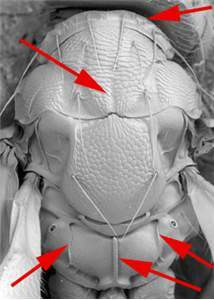 Kamijo, K. (1977) Five new species of Cotterellia (Hymenoptera, Eulophidae) from Japan. Konty�, 45:253�261. Kamijo, K. (1990) Notes on Pleurotroppopsis (Hymenoptera, Eulophidae) and its allied genera, with descriptions of four new species from Japan. Japanese Journal of Entomology, 58:816�826. Hansson, C. (2010). Apleurotropis Girault (Hymenoptera: Eulophidae) new to tropical America, including six new species and biological records. 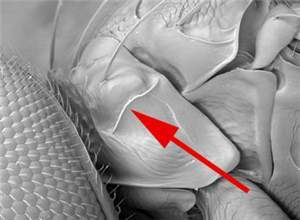 ZooTaxa, 2563:35-52.